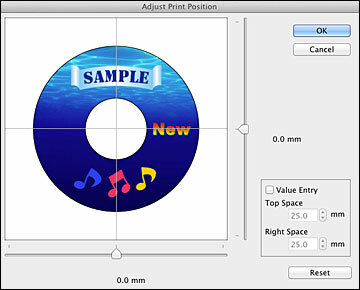 If your printed design is not positioned correctly on the disc, you can adjust the print position. First, load an extra CD/DVD to use for printing test patterns. 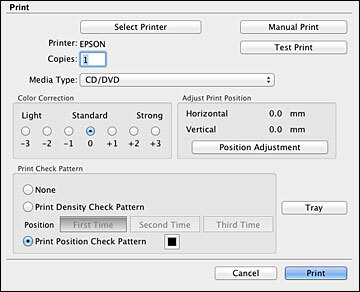 Select Print Position Check Pattern. Remove the disc after printing. Using a metric ruler, measure the distance from the hole to the cross marks labeled Top and Right. Note: Be sure to measure from the edge of the hole and not the edge of the printable area. Click Value Entry, then select the distance for Top into the Top Space box and the distance for Right in the Right Space box.